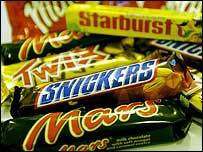 Confectionery giant Mars is cutting 700 jobs at sites in the UK as production is transferred overseas. The company will close one of its main factories in Slough, Berkshire, with the loss of 500 jobs over two years. Owners Masterfoods said it was reducing its workforce by more than 1,000 across Europe, with jobs also being lost in France and Germany. Union officials have criticised the plans, saying Mars had refused to consult with workers' representatives. A further 200 posts will go at the firm's five other plants in Leicestershire, Peterborough, Kings Lynn and Leeds. Pierre Laubies, president of Masterfoods Europe, Mars' parent company, said: "The proposals announced today are all about growth and competitiveness. "We need to be leaner and more focused. We aim to capture the engagement and dynamism of a small business with the benefits of international scale." But Frank Loveday, regional officer of the Bakers, Food and Allied Workers' Union, criticised the company for refusing to deal with unions. "The company made £140m last year and just wants to make more. The managers have also been given huge pay increases. It is sick. "The workers are in a state of shock because there has always been a feeling there would never be big job losses." Mr Loveday said the offered redundancy package was "reasonable" but no substitute for a decent job. Production of Twix bars would move to France and Germany, while Starburst sweets would be made in the Czech Republic. 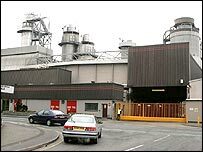 The company's second plant in Dundee Road, Slough, will still make Mars bars, Maltesers and Snickers. Masterfoods Europe said they would be investing an extra £45m in the Dundee Road plant to create a "state-of-the-art chocolate facility". The landmark Liverpool Road site has been a key part of the Slough industrial estate since the 1930s.